Junk the curse and conspiracy theory – celebrate Life’s magic and beauty! None of us is cursed. If we count our blessings, no matter what we are facing, Life will be magical and beautiful. A friend wrote to me, in a bout of depression perhaps, that he felt his Life was cursed – he was faced with a lot of hurdles in his business and career. He was hopeful though that eventually things will work out for him. “But it is the waiting that chews you up! 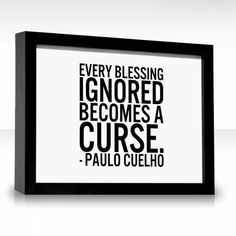 That’s when I feel cursed and let down by Life,” he lamented. I have felt like him before. But over years of waiting, like him, and quite like many of us do, for Life to deliver what I have envisioned, I have learnt that being impatient with Life is of no use. Life is not conspiring to fix you or me. None of us is cursed. Things just happen. Things just are the way they ought to be. It is our wanting our Life to be different from what it is that causes us to imagine that there’s a conspiracy, that we are cursed – this wantingis the root cause of all our suffering too. The best way to respond to Life is to just go with the flow. Drop all expectations. Don’t react to Life. Respond to it with acceptance. This does not mean inaction. This means learning to act with what is than demanding that the situation, the circumstance, the context be different. Osho, the Master, explains this so beautifully: “Life is a curse if you are not aware.” The awareness he is referring to is about the true nature of Life. Which is that there is no Life any of us has other than what is happening to us in the now, in the moment. It is because we are imprisoned by the past – by guilt, grief and anger over what has happened – or by the future – by worry, anxiety and fear over what we imagine may happen to us – that we miss living in the present moment. When we are living this way we are physically present but we are not aware of nor are we in the moment. A man was sitting on the beach brooding over his Life – his wife had deserted him and he had lost his job. It was about 4 am in the morning. Morning joggers filled the beach. Soon children, who were vacationing in summer, started to arrive. By 5.30 am, there was lot of activity. Laughter and joyful screams rent the air. But the man was nonplussed – he kept staring blankly at the horizon. He looked lost, sad and beaten. A jogger paused by him to admire the sunrise – it was a magnificent sunrise, a spectacle to behold. The jogger took a deep breath and, to share the moment with the brooding man, more out of courtesy, than with an intention to intrude, exclaimed: “Amazing sunrise, eh?” The man was shaken out of his stupor. He sounded irritable as he barked at the jogger: “What sunrise? Just leave me alone, will you?” Most of us are like that brooding man. And because we constantly keep finding reasons to bark at Life (the jogger’s but a metaphor), we miss its magic and beauty. To deal with and overcome this mind-made theory of curse and conspiracy, just follow Osho’s prescription – be more aware. Stop and smell the roses, pause and cherish each sunrise and sunset, celebrate the waxing and waning of the moon, and feel the raindrops on your face. Each dinner that you miss with the family, remember, is an opportunity of a lifetime lost. There’s so much that Life’s offering on its menu for you. You will see and experience all of it, only if you are there. Hello, where are you? Author AVIS ViswanathanPosted on September 2, 2015 March 14, 2016 Categories Acceptance, Art of Living, Count your Blessings, Curse, http://schemas.google.com/blogger/2008/kind#post, Inner Peace, Intelligent Living, Osho, SufferingLeave a comment on Junk the curse and conspiracy theory – celebrate Life’s magic and beauty! 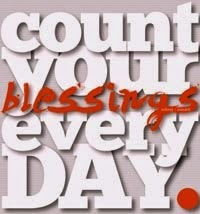 Rebooting to “count your blessings”! The first lesson in elementary Math that we learn is to count. And yet, as we grow older, that’s something that we fail to do. That’s why we grow older, age biologically, but don’t quite grow wiser or evolve. There lies the problem: Because we just don’t count what we have. We are so deeply entrenched in survival mode that we don’t see the beauty and magic of Life. Here’s what you can do to get out of this mode. To break free from it, take a day off from work and just reboot!. Just get out on the streets. Stop at a busy traffic intersection to see how much the much-maligned cop has to labor to maintain even a semblance of sanity. Watch the flower-seller stitch the garland together as beads of sweat trickle down her neck. Notice the garbage clearance squad, at work, struggle with the insane and reckless manner in which we consumers dispose our waste. Go to a train station. Sit calmly and observe Life as people rush to go to work and get back home. Or go to the emergency ward of a hospital. Watch people, study their emotions, understand their challenges, recognize valiant acts and daily contributions from people ‘apparently’ removed from you that make your Life possible each day! Get back home. And make a list of things that you have in the backdrop of all that you just observed all day. Count the number of items on that list. Write that number down with a thick, red marker pen and put it up on your desk. And each time your mind drags you into the darkness of the ‘I don’t have’ alley, pull out that list. Let that number in thick red ink remind you that your Life is blessed. This is what they mean when they often say “Count Your Blessings”!!! Author AVIS ViswanathanPosted on August 8, 2014 March 14, 2016 Categories Art of Living, Count your Blessings, Inner Peace, Intelligent LivingLeave a comment on Rebooting to “count your blessings”!